Nuclear power plants  use the heat generated in a nuclear reactor's core (by the fission process) to create steam which then operates a steam turbine and generator. About 20 percent of electric generation in the USA is produced by nuclear power plants. 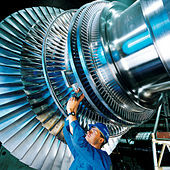 Gas turbine plants use the dynamic pressure from flowing gases (air and combustion products) to directly operate the turbine. 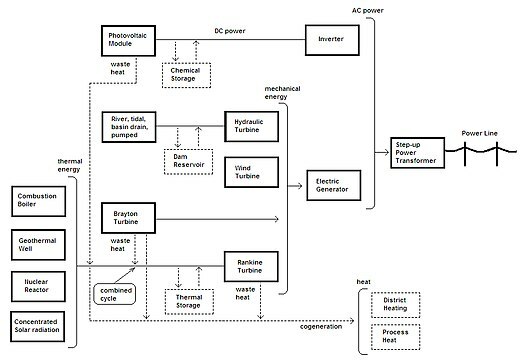 Natural-gas fuelled (and oil fueled) combustion turbine plants can start rapidly and so are used to supply "peak" energy during periods of high demand, though at higher cost than base-loaded plants. These may be comparatively small units, and sometimes completely unmanned, being remotely operated. This type was pioneered by the UK, Princetown  being the world's first, commissioned in 1959. Biomass energy can be produced from combustion of waste green material to heat water into steam and drive a steam turbine. Bioenergy can also be processed through a range of temperatures and pressures in gasification, pyrolysis or torrefaction reactions. Depending on the desired end product, these reactions create more energy-dense products ( syngas, wood pellets, biocoal) that can then be fed into an accompanying engine to produce electricity at a much lower emission rate when compared with open burning. As of 2015 [update], the largest photovoltaic (PV) power plants in the world are led by Longyangxia Dam Solar Park in China, rated at 850 megawatts. In some cases operators deliberately produce less power for economic reasons. The cost of fuel to run a load following power plant may be relatively high, and the cost of fuel to run a peaking power plant is even higher—they have relatively high marginal costs. 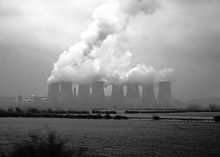 Operators keep power plants turned off ("operational reserve") or running at minimum fuel consumption[ citation needed] ("spinning reserve") most of the time. Operators feed more fuel into load following power plants only when the demand rises above what lower-cost plants (i.e., intermittent and base load plants) can produce, and then feed more fuel into peaking power plants only when the demand rises faster than the load following power plants can follow.